There are many causes for arthritis of the ankle joint. Although a variety of non-operative treatments may be tried including a special brace, these are of not usually successful in the long term. For milder forms of arthritis an arthroscopy (key hole surgery) to clean out the ankle joint can offer good relief of symptoms. More severe ankle arthritis may be treated either by a fusion (surgical stiffening) of the ankle joint or an ankle joint replacement. Ankle fusion surgery often can be done utilizing innovative techniques using tiny skin incisions. Ankle fusion performed this way reliable and the recovery much quicker. The surgery may be performed using a local instead of a general anaesthetic, allowing earlier recovery and discharge from hospital. 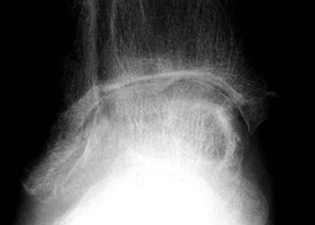 Preoperative x-ray of a patient who has severe post-traumatic osteoarthritis of the ankle joint. 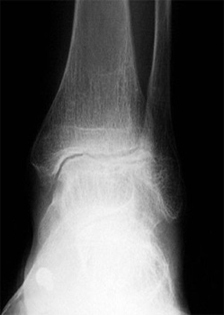 Post-operative x-rays following fusion of the patient's ankle using an innovative mini-open technique. 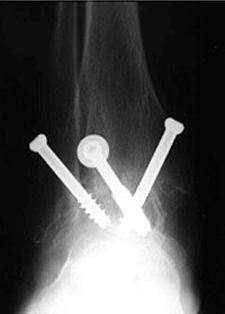 Other methods of internal fixation for ankle fusion include a combination of screws and locking plate. 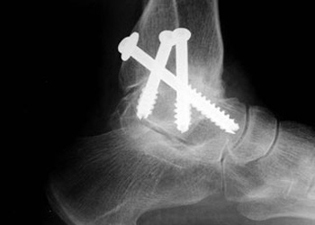 More recently as an alternative to ankle arthrodesis, total ankle joint replacement (TAJR) has been performed successfully. Dr Beischer has worked closely with both Dr Mark Myerson and Dr Sigvard Hansen who are world leaders in the development of this new technique. In carefully selected cases Dr Beischer may offer this technique to patients with ankle arthritis. TAJR permits movement of the foot and ankle, and protects the adjacent joints of the foot from further deterioration, which, may occur following an ankle fusion. 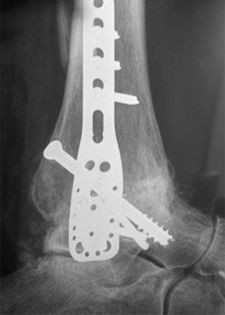 Post-operative x-ray following successful total ankle joint replacement. 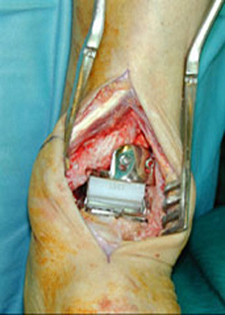 Photograph of the 'Hintegra' total ankle joint replacement prosthesis. 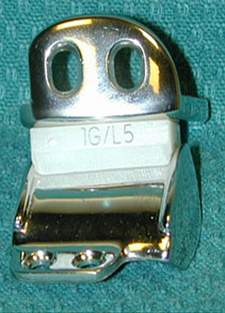 This is the Hintegra Total ankle replacement prosthesis. It comprises of 3 parts. 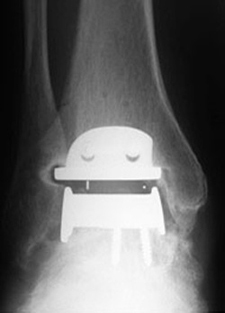 The metal components are fixed to the tibia and talus. The "white" polyethylene (plastic) component forms the new ankle joint and allows the ankle movement.